an existing IT team to full-scale IT management and consulting. With technology moving at lightning speed, it can be difficult to stay on top of your company's technology needs. Often, marketing firms or individuals with little working knowledge of computers and networks claim to be IT experts. Our professional staff offers more than two decades of experience. We keep on top of the latest trends and technology and we can tell you whether it's right for your business. Additionally, we are able to complete most work remotely, saving you time, money and hassle. We stand behind our work and provide our clients with the highest quality products and services—guaranteed. 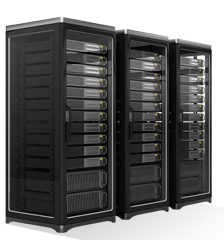 House your servers with us to save money and increase security. Get back to business after a natural disaster or crisis. Active management and set up of employee workstations. Submit and track tickets quickly and easily from your computer. Proactively monitor and manage your equipment. Minimize the stress of relocating or setting up a new business with our vendor management and planning services so everything is streamlined and running smoothly. Resolve issues quickly via remote connection. No need to wait for on-site support. Proactively plan and measure risk. If you have a unique need that’s not listed above, please call us or email us your questions. We can most likely offer a solution.